When I was a kid, sometimes my dad would buy those cans of Hormel® Mary Kitchen® corned beef hash. I remember being fascinated by the way the unappetizing pasty, fatty, white hash would turn lovely, golden, and crisp once heated in a pan. As a child, I loved it. Loved it, that is, until about age 13, when I denounced meat and lived a not-so-balanced veg*n lifestyle for 10 years. Moving on. Hand me a steak. Dad would fry up the hash on Sunday mornings, or a can would get packed in the food bag to take to the cabin Up North (the proverbial cabin location for any Midwestener). Although canned corned beef hash was by no means a staple in our house, I think a thorough investigation of my parents' pantry would most likely reveal a can of hash hidden in the back corners, way up out-of-reach, saved for my father's solo trips to the cabin.... A guy needs his salty, fatty, meaty fix every now and then. 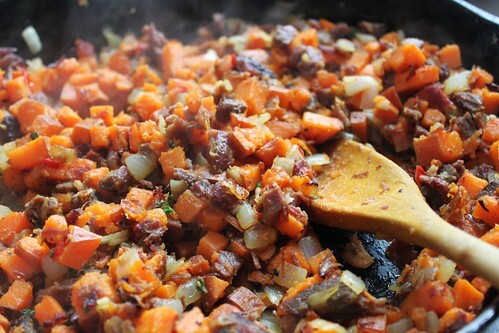 This hash is much better than the canned hash of my childhood, a kicked-up modern twist on an old favorite. I used homemade corned beef, sweet potatoes, and onions, seasoned with fresh thyme leaves and a jalapeño pepper. Simple? You bet. Flavorful? Absolutely. Homemade corned beef is a flavor powerhouse. This stuff tastes better than the canned hash any day, has way more nutritional value, and probably only a small fraction of the sodium. And it looks beautiful, perfectly suited for any meal of the day. I served mine with a sauté of kale, onions, garlic, and roasted red peppers, and a scoop of raw sauerkraut. It would be wonderful with homemade gluten-free toast, or scrambled eggs. Or, just eat a scoop all on its own. I hope you enjoy it, whether for St. Patrick's Day celebrations or any other day of the year. 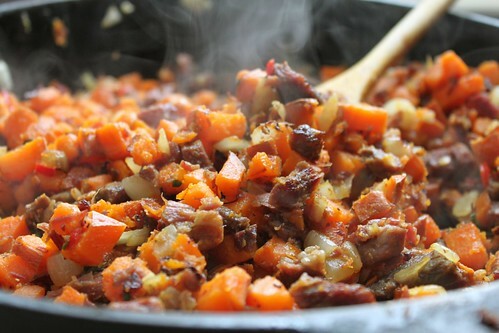 Finely chop the sweet potatoes, onion, and corned beef in small, fairly consistent pieces (I did about 1/4-1/2"). Heat the 2 Tbsp of fat in the pan over medium-low heat, add the onions and jalapeño, and saute until onions become translucent. Then add the potatoes and the corned beef. Saute for for about 10 minutes, stirring often. Then add remaining 2 Tbsp of fat, turn up the heat, stir, and fry until potatoes become slightly crisp and golden. Remove from heat, add fresh thyme leaves, and season to taste with freshly cracked pepper and unrefined salt. I didn't need to add any salt, but depending on your tastes, you may find the salty beef isn't quite enough for you. 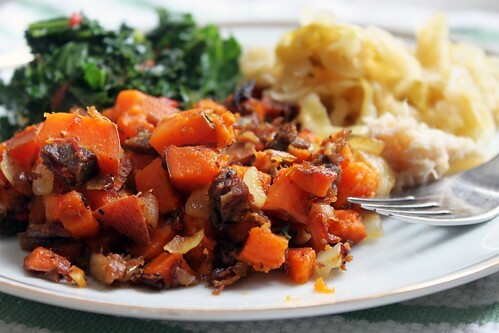 For a delicious complete meal, serve with a scoop of raw sauerkraut and sauteéd vegetables like cabbage or kale.